Top Amsterdam attractions like the wonderful 17th-century city center and the canals, give Amsterdam a face that's recognized across the world. The high number of art museums, brown cafes and ages-old squares are among the top attractions in Amsterdam, too. Among the more notorious Amsterdam highlights are the coffee shops and the Red Light District. 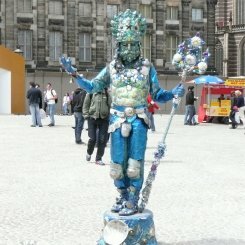 This page lists the top 10 Amsterdam tourist attractions as well as a few Amsterdam sights that are off the beaten path. No less than 165 canals divide the small city centre, crossed by over 1,200 bridges. The canals are lined with green trees and very typical canal houses and old ware houses from the Golden Age (17th century). Here's where the wealthy citizens in the 17th century lived. Some parts of the old city centre even date back to the 13th century (like the Old Church). The best way to see the canals, is through a canal cruise. They typically take one hour and leave from the Damrak, just outside the Central Station, and the area around the Leidseplein. As the city centre is small, other good ways to explore the city centre is by renting a bike - cheap, fast and typically Dutch - or by walking. The small canal lanes aren't very suitable for motorized traffic, so this part of town is very quiet. 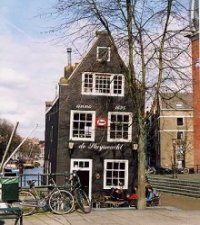 Amsterdam is known for its small boutique hotels in the canals area - find them through easytobook.com. 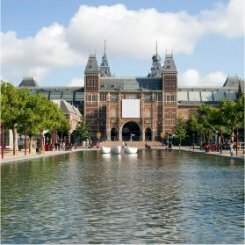 One of the biggest Amsterdam attractions, the Rijksmuseum focuses on famous painters from the Dutch Golden Age. The most famous piece is Rembrandt's 'Night Watch'. Other famous painters on display here are Vermeer and Jan Steen. While the Rijksmuseum is only partly opened due to massive renovations, the good news is that the current exhibition takes you past all it's highlights: some 400 'Dutch Masters'. It's a very well done exhibition. A lovely court - a group of houses around a garden - dating from the 14th century, right in the middle of the old city centre. Such courts are unique to the Low Countries. The Begijnhof only has two entrances (which are only open during the daytime). You can visit the Roman Catholic chapel inside the court too. The Begijnhof is now a religious centre of silence. It can be visited, but not by groups and any talking should be done outside the gate. It's so easy to miss that it took this author several years to disover it. There are over 500 cafés (that's how the Dutch call pubs) in the city centre and the 'brown cafés' are the most typical of Amsterdam. Their name refers both to their dark wood interiors and walls stained by decades of cigarette smoke (even when smoking is now banned in Dutch cafés). These pubs are hardly touristy - they're more like an extended living room of ordinary Amsterdammers. Amsterdam folk singers like André Hazes had their first teen performances in the brown café owned by their parents. Visit for example Café Welling (Jan Willem Brouwersstraat 32) or Café de Pels (Huidenstraat 25). For more, go to Amsterdam cafes or the Amsterdam pub guide. One of the most touching Amsterdam sights, the Anne Frank House is visited by 1 million people a year. 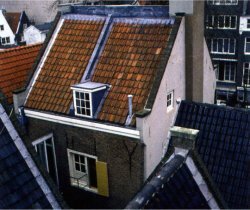 In the Secret Annex of this house, Jewish girl Anne Frank and her family went into hiding for the Nazi's who had occupied Amsterdam. The house has been kept in the original state. There is no guided tour, since the house is too small, but there are guidebooks in many languages included in the entrance ticket. There are also several explanatory films. The Vondelpark (named after the 17th century poet Vondel) is Amsterdam's most popular park. During the 1960s and 70s, it was one of the gathering places of Amsterdam's hippies, who slept here at night. During sunny days, the park is brimming with life: people meet here for picknicks and birthdays, to play soccer or to read a book. At the south side of the park, you can rent inline skates. The park has 4 places to eat or drink. Particularly nice are the terraces of the Filmmuseum and the Open Air Theatre, which also gives free performances from June to August (Thu to Sun). 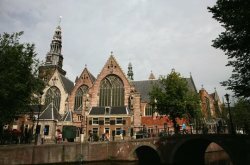 The oldest church of Amsterdam, built around 1250 AD, and paradoxically located in the middle of the Red Light District. 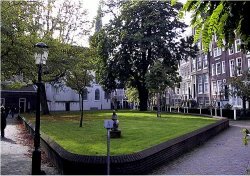 Many famous Amsterdammers are buried inside the church or were married there. The church now houses exhibitions (among others the famous annual World Press Photo awards are held here), but it's also a wonderful building in it's own right and one of the underestimated Amsterdam tourist attractions. You can visit the church during the afternoons. The Waterlooplein is Amsterdam's permanent market and it's renowned for it's queer collection of second hand goods, queer stuff, army clothes, hippie jewelry, art, and on. You'll find anything but the usual here, often not too expensive. 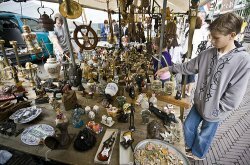 The Waterlooplein market is located behind the City Hall (Stopera) and it's open Mon-Sat from 10am - 5pm. It's among our favorite Amsterdam attractions. On to the more notorious Amsterdam highlights. Whatever you think of it, the Amsterdam Red Light District is famous and unique and it's one of the principal Amsterdam attractions. Behind hundreds of red lit windows, young ladies in lingerie try to seduce the men (and occasional women or couple) to come in their room. There are also live adult theatres and adult shops. The Red Light District isn't there because the Dutch are such big prostitution fans - most clients are foreign tourists. But the Dutch simply argue that you can never fully ban prostitution, and if you allow it in the open, you can also regulate and control it. It's a safe area to visit. There are always tourists present from all ages and genders, as well as police and lots of everyday Amsterdammers. The other "controlled sleaze" thing in Amsterdam. While other drugs are still fully banned, Amsterdam has over 200 "coffee shops" where you are allowed to buy small quantities of marihuana or hash for personal use. Their uniqueness in the world have put them among the most popular attractions in Amsterdam. The idea behind the coffee shops is the same as the legalisation of prostitution: allow it out in the open so you can regulate it. You can visit coffee shops without you being expected to buy or use any mind expanding stuff yourself - they actually do sell coffee and soft drinks too (but usually no alcohol). 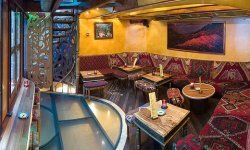 The Amsterdam coffee shops are unique in the world, and among the major Amsterdam attractions. 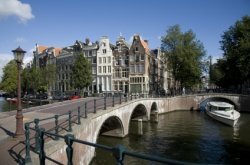 This overview of top Amsterdam attractions is far from complete - there are many more Amsterdam highlights depending on your interests, so click around on this site to find more Amsterdam attractions. Here's more about our favourite Amsterdam museums, plus an overview of all museums in Amsterdam that get over 25,000 visitors a year. 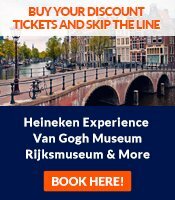 Here are our separate pages about important museums: the Rijksmuseum, the Van Gogh Museum and the Amsterdam Historical Museum. Read more about things to do in Amsterdam here, or go back from Amsterdam attractions to Amsterdam Advisor.